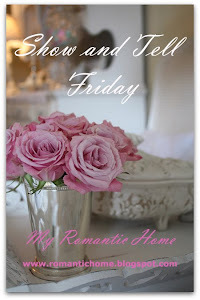 My Romantic Home: Happy Valentine's Day! I started making these cookies 3 days ago. On Sunday, I mixed the the dough, which called for 1 pound of butter! Monday night I rolled them out, cut and baked them. Last night was the fun night, decorating the cookies. What fun! I can hardly wait to take my cake decorating class next month. I brought some into work today (the second photo) and I wrapped some in cellophane bags for my daughter to take to school for her friends (the third photo). Look at the cute Mary Englebreit tags I got at Michaels for 25 cents for 6 tags! The cookie recipe can be found here. Check out their cute cookie cutters too. I used Vanilla extract in the cookies and Almond extract in the icing. The cookies are very soft and melt in your mouth. They are also VERY sweet. These are just absolutely gorgeous! What a talented baker you are! I am impressed! I hope your Valentine's Day is a sweet one! sounds like so much fun... I had fun just reading about it. Thanks for the recipes. Happy Valentines to you ! 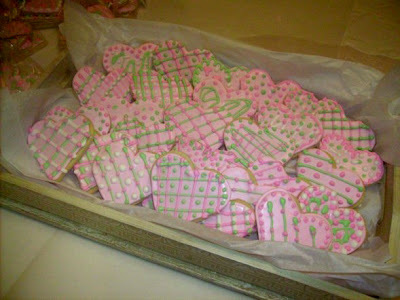 Those pink & green cookies are adorably sweet! mI am so impressed. They look like a professional baker made them. They look almost too good for anyone to eat. So elegant. 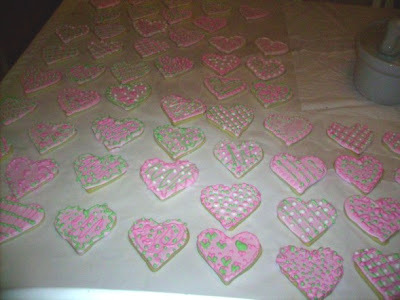 Beautiful colors for Valentine's Day cookies and your decorating is wonderful. Hope someone nice spoiled you a bit today after all your kindness! I love your cookies and the tags are beautiful. What lucky valentines your daughter will have. Your cookies look better than anything I saw at my bakery yesterday! Not only do they look totally professional, but delicious too! I love the pink and green together. 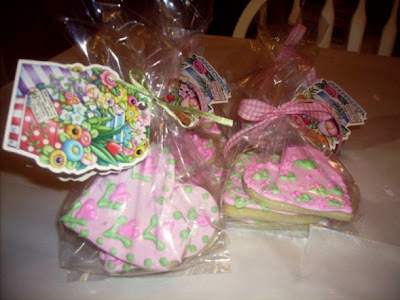 This makes me want to pull out my Easter cookie cutters and start making cookings. Your cookies look lovely! Thanks for including the link to the recipes ... I may have to try them! These cookies are absolutely magical. You are such an inspiration. It makes me want to hang my little head in shame that I let such an opportunity for beauty pass me by. I agree with Andrea and hope to make something lovely for St. Patrick's Day or Easter. 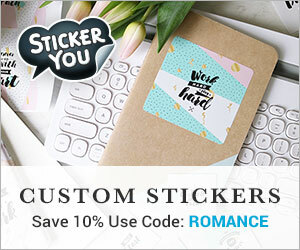 I love your beautiful, beautiful blog. It's one of my very favorites! Thank you all for the kind comments. Every time I make decorated cookies, I always have a vision in my mind of what I want them to look like and I'm always let down. These cookies are the closest to that vision so far but not quite there. I'm going to keep practicing and one day I will be there. Wow the cookies are wonderful! I have to try the recipe for Easter Egg Cookies. Can't wait, thanks for the recipe! I have baked many cookies in my life, I used to cook for fraternities even, but they never got cookies as pretty as yours! I am sure your recepients were very happy. Those are *beautiful*. I think that I'm going to save the picture for inspiration for next year.